I’m not one of those people who particularly likes to shop. It can definitely be fun with friends or family, but in that case, I enjoy the company rather than the shopping. I don’t like shopping for clothing, in particular, because I find it immensely frustrating. Finding clothing that fits right, is comfortable, and is well-priced is always a challenge. In theory, tailoring should fix some of the difficulties of shopping. You can completely bypass the melt down that comes with lugging 15 different pairs of pants into the dressing room only to discover that none of them fit. I love the idea of having my clothing made just for me. In an ideal situation, the clothing looks good and is comfortable. There are no parts that are too loose or too tight; nothing is too long or too short. But in reality, I’ve found that my tailored clothing hasn’t lived up to its reputation. When I was here for study abroad, I was living outside of the city in an area that had a small town center. There were a few shops that sold fabric and tailored clothing. One of my friends had developed a relationship with one of the shops in the town center and suggested that I go there. I wanted to buy a kurta suruwal (a shirt and pants, the Nepali equivalent of the salweer kameez), so I picked out some fabric, got measured, and had the shop owner sew it for me. I thought I was getting a great deal. The whole thing, with fabric and tailoring, cost 500 rupees, about 7 dollars at the time. I got the kurta suruwal and started wearing it around sometimes. One time I wore it to meet Tri’s parents. When his mom saw me, she looked at me funny. “What’s wrong?” I asked. She walked over to me and started yanking the bottom of the shirt, trying to straighten it out. But to no avail. “The whole shirt is crooked,” she replied. And it was, but I hadn’t noticed until she pointed it out. Later, when I wanted to get another kurta suruwal sewn, I tried going to other little shop in the town center. Unfortunately, they made the armpits too small, and when I took the shirt back to have it resewn, they must not have understood me because they ended up making the waist area larger. The whole thing looked ridiculous on me, and I threw it out. When I was here before, I was living in rural areas and was washing my clothing by hand, so I wanted to wear comfortable and easy-to-wash kurta suruwals. But now that I’m in the city most of the time, I wear western clothing. 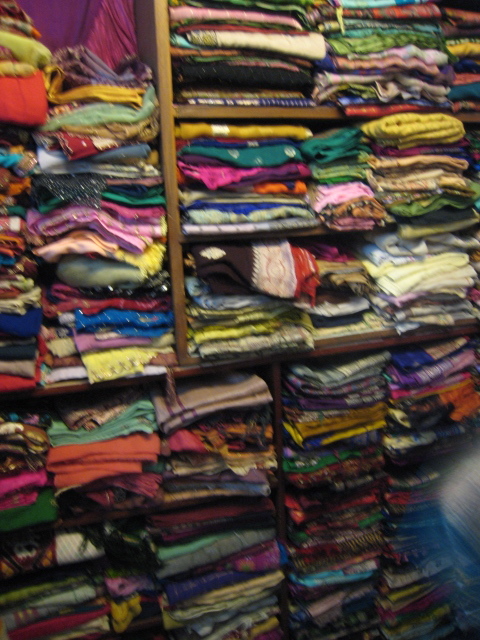 However, I’ve tried to get some kurtas, Nepali shirts, made. I’ve had several shirts sewn at a place in the city, a supposedly fancier place than the shops I frequented before, but, again, I’ve had bad experiences. Both of the shirts were way to small in the shoulders. I had to take them back to the tailor to have them resewn. Even then, though, they didn’t do a great job. The fabric on one of those shirts bunches up in the middle and the other one is unwearable because the shoulders are still too small. What is it? Am I a really weird shape or something? 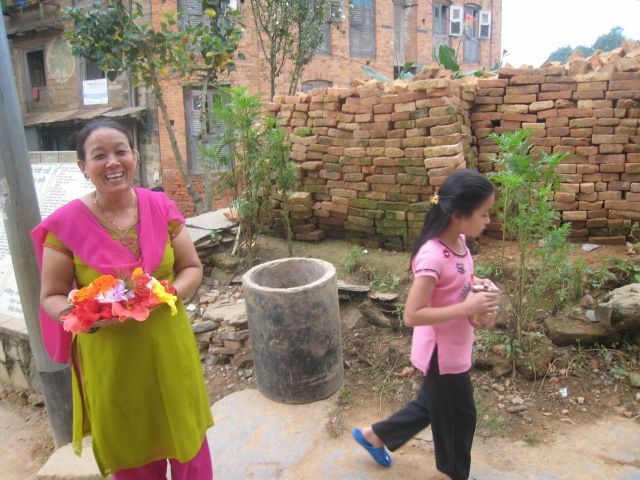 I think I’m a bit taller than the average Nepal woman, but with tailoring, size shouldn’t matter! Have any other women who have had things tailored experienced something similar? I love the idea of tailoring, but I’m feeling pretty negative about it right now. Is there a particular way I should be going about it? Any suggestions would be greatly appreciated! This entry was posted in Clothing and tagged kurta suruwal, Nepali Clothing, salwar kameez, Shopping, Tailored Clothing by nepali jiwan. Bookmark the permalink. I just reposted some blogs from my old site and two on this exact topic!! I have a tailor now who I believe is good, but who knows what can happen with the next item I have her stitch! I have had the same problem as you with a previous tailor, sleeves and arm holes too tight, shoulders too tight but I think with time we learn more about our measurements and listen less to the tailors that think they know how to fit us! Looks like somebody needs to take up sewing as a new pastime! That’s actually something I want to learn since I love all those pretty fabrics that they make Indian/Nepali clothing with but I am very particular about how they feel and the proportion size. It annoys me getting clothing tailored I think I just like the instant gratification of getting something new and I dislike waiting 😛 Anywho, hopefully this time they will finally get your sizing right! No more crooked shirts! I wish wish wish I could sew! It’s something I’ve wanted to learn for a long time, but I’ve never really had the chance. Every time I come to Nepal, I pick few fabrics and had kurta sarwal made. Also I will pick few blouses for my sari. I have been using this tailor in Chikamugal for a long time and she is really good. The tailor name is ‘Little Lady’. I have never had a bad cloth made from her and I am using her for last 10 years. Chikamugal is near Maru and near Darbar Square in Kathmandu. Ooo. maybe i can find her! I’ll ask around and see if I can find her shop. When I was in India I wanted to make kurta outfits for my two younger sisters. I thought it would be fun for them to have something South Asian to wear. I asked my sisters to measure their shoulder width and height, etc and send them to me in centimeters, then took the measurements to a shop in town. The tailor kept arguing with me that the measurements couldn’t be right since there are “no women this big.” Granted, my sisters are larger than me, and rounder than the average Indian, but the guy just wouldn’t believe my measurements. No amount of pleading with him would make him believe me that the measurements were true, so he altered the measurements to his own liking. Sadly the outfits didn’t fit when I got home… although one of my sisters lost weight for our wedding and was really happy to find she finally fit into the outfit 6 years later. That’s unbelievable that he didn’t use the measurements you gave him. I would have been so pissed! The cousine from my friend stitched a kurta for me. Before actually she to measured up by me every cm of my boddy. I’m glad the one that she go you worked out. I picked my kurta suruwal up, and it fits!! I’m so happy 🙂 I think I found a good tailor. I now have 7 tailor made kurtas that are too tight across the chest and back. As AmericanNepali said, it just seems like they can’t believe these measurements are true, so they pare them down to something that makes sense to them. I think if I lose 30lbs they may be loose enough to fit appropriately across the chest and back, but then I will need to get them altered to fit my waist. I think I’d do that gladly, but it would be nice to have a tailor made kurta that fit like tailor made clothing. BTW, I’ve tried 3 different shops, all with this same result. I honestly don’t know why it’s such a big problem, but at least I don’t feel alone! Recently I was talking to some Nepali family friends in Boston, and they were saying that every time they get a shirt tailored in Nepali, it’s too tight in the arm pits, which is an area I always have trouble with when getting clothing tailored. I thought I had found somebody pretty good in Kathmandu before we left Nepal. I ended up taking a lot of stuff to her, but not everything she did was great.